1. Preheat the oven to 200ºC, gas mark 6. For the topping, bring a pan of water to the boil and add the potatoes. Simmer for 15 minutes until tender, then add the cauliflower and simmer for 8 more minutes until the potatoes and cauliflower are very tender. 2. Drain and return to the pan, and heat for a few minutes to dry out the potatoes and cauliflower. Add the milk and butter, and mash together. Add the cheese and mix well. 3. Meanwhile cut the fish into large chunks and set aside. 4. Heat the olive oil in a frying pan and cook the onion for about 5 minutes until softened, then stir in the flour and cook for a minute. 5. Slowly add the hot vegetable stock stirring continuously until you have a smooth sauce. 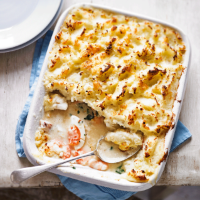 Add the crème fraîche and stir, add the fish, prawns and parsley, then season. 6. Spoon the fish filling into a 1.5-litre ovenproof dish and arrange the eggs on top. Spoon on the mash and rough up the top with a fork. Bake for 30 minutes until the top is golden, the filling is bubbling and the fish is cooked through.